I don’t know about you but I love the fall. The air turns crisp and the scenery beautiful, but I think what I love most is the new variety of foods we often eat. We put away the grill for the year (or use it less frequently) and utilize our stoves and ovens more. Typically, I try to share healthier recipes but this is one of my favorite sinful treats. 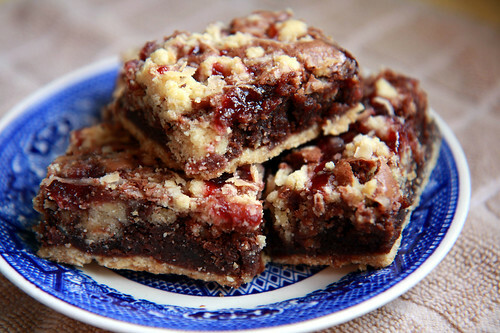 Chocolate raspberry bars are pretty easy to make and they’re great to bring to a potluck or tailgating. Whenever we share these, I go home with an empty plate. Preheat oven to 350-degrees and grease a 9x13 baking dish. Combine softened butter, brown sugar, and flour to make coarse crumbs. Measure approximately 2 cups of the crumbs and press evenly into the greased pan. Bake for 10 minutes or until golden brown. While the pressed crumbs are in the oven, combine condensed milk and 1 cup of the chocolate chips in a saucepan and stir together over low heat until chocolate chips are melted and the mixture is combined. Pour chocolate/condensed milk mixture over hot crust and spread with a spatula until all of the crust is covered. Sprinkle remaining crumbs over chocolate. Drop jam by ½ teaspoons randomly over crumbs (less is more). Scatter remaining 1-cup of chocolate chips over the entire dish and bake for 25 minutes.